Brno 20. 7. - 29. 7. Praha 29. 7. - 5. 8. 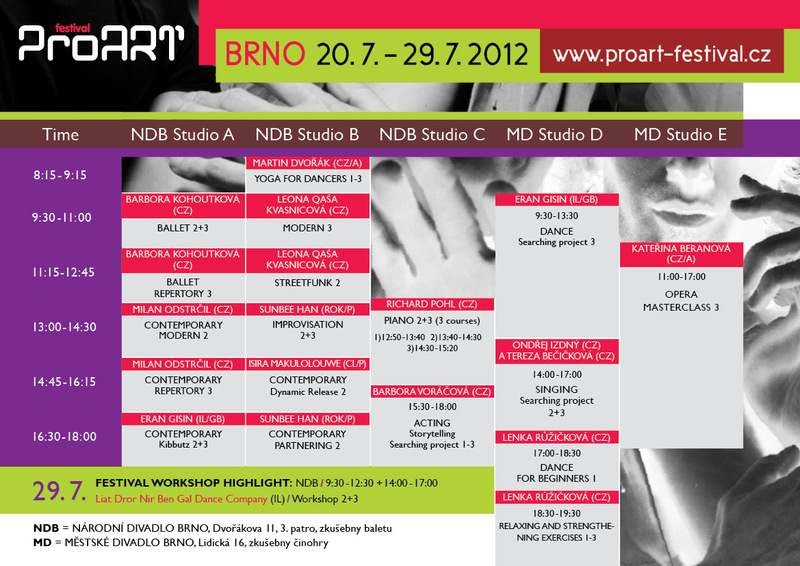 ProART presents in cooperation with the National Theatre Brno, Brno Municipal Theatre, National Theatre Prague, Bolek Polivka Theatre, Stadion, Experimental space NoD the 9th International multi-genre workshop Festival ProART. The festival consists of two parts - daily artistic workshops where all participants with different professional levels choose their own program from an extensive clasess schedule - and the festival's evening performances program, which this year is equal to twenty shows. We welcome this year 27 teachers from 14 countries worldwide. Our effort is in addition to “workshop fixed stars" of contemporary dance every year to enrich with new genres. This year you can next to the guitar, acting, singing, photography courses, also take part in creative writing under leading of starwriter Josef Formánek or playing the piano with Richard Pohl. The festival is open to everyone without restrictions of age or professional level, classes are graded according to difficulty. Accompanying program ProART Festival will be presented at Bolek Polivka Theatre and Stadion na Kounicove in Brno, in Prague then a week later at Experimental space NoD. The guests are coming from Portugal, Austria, Poland, Hungary, Slovakia, Israel, and of course from the Czech Republic. "Who of the great artists created their work at least one that did not stem from the contradiction between dreams and reality? Imagination is the creative energy driving force behind every artist. Therefore, for the first time may seem a trivial choice of topics and all-inclusive. Our tendency is for our own experience from previous years to highlight the work that comes from artistic motives, needs to create, to communicate emotions and feelings. Opposite the efforts of conceptual art, which can be viewed only reason we want this year limit. Individual grab these three topics is the biggest challenge for an artist who knows how to move audiences internally and emotionally to intervene. Reflections of a fantasy world between dream and reality are artistic inspiration and audience prize at the same time ... "
There are 2 evenings for young choreographers to 35 years who can log into their festival choreography shorter (20-30 minutes). The specified conditions are: the maximum number of dancers 4, the continuity of the festival theme, ProART reimbursed honorarium or travel only provides accommodation for two nights (before and after the performance). On the contrary, we participate in the festival workshops for free. For those interested in one-week courses we can provide accommodation, which did not pay any of the participating himself. The aim of this platform is to offer young choreographers to present their work in professional terms, but without the motivation of financial earnings. Every beginning is difficult and may not be immediately associated with the financial rewards. On the contrary, we want to awaken a greater desire to create, find ways to succeed in the fierce international competition and promote the desire to constantly improve. We also offer festival audiences a wider range of dance styles and choreographic styles, given that our festival lasts one week.